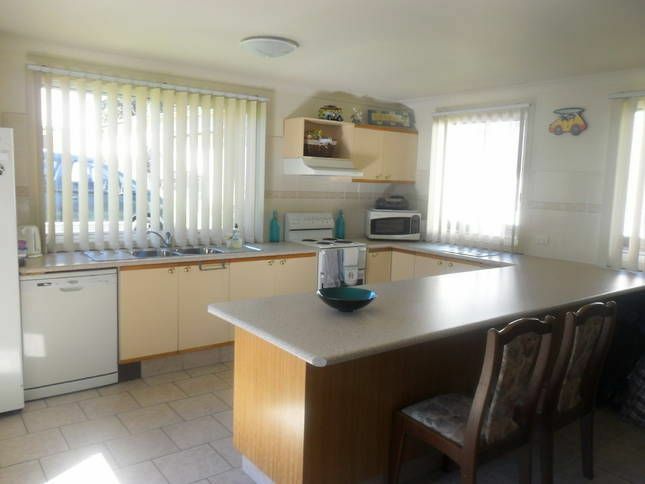 Modern renovated three bedroom self contained Holiday house right on the lake with large Living area's, large covered rear Deck, TV's to all Bedrooms & Living area, Fans to all Bedrooms & Living area, Air-conditioned, Gas Heating, large BBQ,1 large Bathroom & 2 Toilets. Beautiful self contained house right on the lake perfect for 2 families as 2 of the bedrooms are family bedrooms. Water activities from the rear of the block include Boating, Sailing, Kayaking, Swimming & Fishing/Prawning. Deep water to your left for Skiing and shallow water to your right for toddlers/Kids. We are a family of 4 with 2 teenage children. We have owned this house within our family for over 20 years, we purchased this house from my sister. I am Australian with an English born wife. It has been in the family for many years & at one time we owned the property next door. It has always been a destination that we have been able to come to to unwind and relax. The lake is safe for children with the added bonus that we can also water-ski from the rear of our property. We loved staying at this house. There was plenty of room for all the family. The views were wonderful especially when we were able to do some storm watching. The use of the kayaks was enjoyed by all especially our kids. Mark and Karen were very helpful. I would definitely recommend this place to anyone wanting to stay in Sanctuary Point. Location was perfect. The house was very clean and with all what you need (and more than what you find in a normal rental place). The owners are very kind and always available over the phone. What a fantastic place to stay, hoping to be back again soon. Everything you need for a great weekend away. Close to the water and local shops the wild life is amazing. The local County club was a hit too as their courtesy bus pick you up and drop you back. We thoroughly enjoyed our stay, very clean, everything you need is there. We also took our dog along very safe and secure yard. Kayaks a big hit. Thank you and we would love to return. The property and the owners were every bit as good as other reviewers have said. Great spot, great house and great service. Even the neighbours were friendly. Only regret was that we didn't stay longer. Thanks Karen and Mark for a great stay.